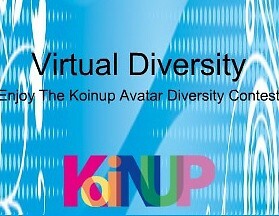 A couple of days ago, we launched on Koinup the Virtual Diversity Contest. The Competition goal is to collect the countless diversity of avatars, based on the assumption that behind any avatar there's a real person, and overall that the avatar is a mirror of the unique personality of the "person behind". Only a few hour after the announcement, there were already about 100 members in the group (now are more than 150) and dozens of interesting submissions. Museo del Metaverso, that will kindly provide its gallery for the upcoming exhibition with the winning images of avatars, and MondiVirtuali.it, media partner of the initiative, helped us with the promotion of the contest, by calling to action their own communities of virtual worlds and metaverse members. Have a look at the contest here and if you own an avatar, then you "EVEN" can submit your own entry! JOIN NOW! Thanks for the link, Pier. What a fun contest!